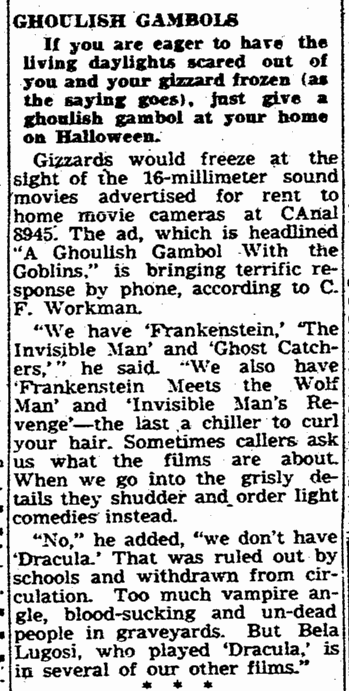 I never take the villainy of Boris Karloff or Bela Lugosi seriously anymore. 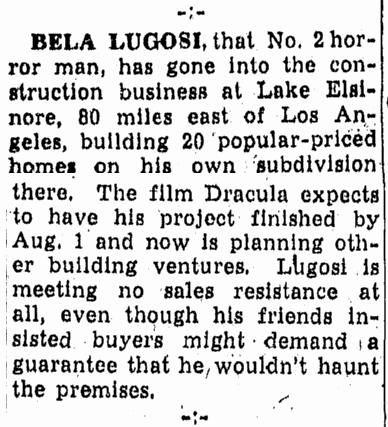 I know the Lugosi lad, and he’s a big lambie pie of a continental gentlemen, a hand-kisser and dog-patter who could not possibly perform feats of skullduggery in real life, any more than Boris Karloff, now that his gentleness has been so well publicized by the badly advised movie press agents—just a couple of babysitters, that’s what they are. NEW YORK, April 24. – With the addition of Dave Brumett in the Southwest territory and Don Marlowe on the West Coast, the McConkey Music Corporation has increased its business potentials by no small amount. Brumett, formerly with Monk Arnold in Atlanta, does a considerable one-night business in the South and Southwest. He has little bands all thruout the territory who get anywhere from $275 to $400 for a one-nighter. Marlowe’s addition to the office means that McConkey will now have Eddie Bracken, Bela Lugosi, Zasu Pitts, Charles Ruggles and Edgar Kennedy for everything except pictures. Marlowe will head the McConkey West Coast theater department which will take in pictures and television as well. It is also understood that McConkey may make an outright buy of the Chicago office of Frederick Bros.